Also known as Myanmar, Burma is an up and coming scuba diving destination in the Andaman Sea. Closed to the outside world until 1997, this small country is still well off the tourist track. A Burma liveaboard is the best way to reach some of Southeast Asia’s best and most remote diving before the rest of the world finds it. Divers in the Burma Banks and the Mergui Archipelago can hope to encounter large pelagics, sharks and rays, thriving corals, and plenty of macro life. Miles from Thailand’s tourist crowds, dive safaris here often make history, plunging into unmapped sites. Best of all, a lack of commercial fishing has left these waters in pristine condition. Here at The Adventure Junkies, we pride ourselves in taking you off the beaten path. We’re here to help plan your perfect liveaboard diving vacation in Burma’s exotic and untouched waters. For a family style safari experience, Miss Moon is your best bet. 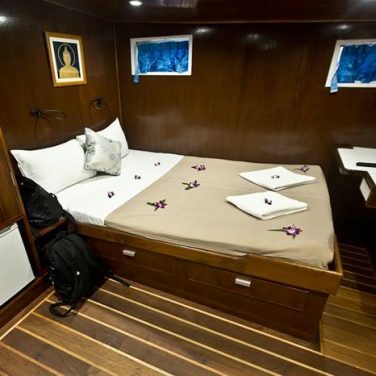 The five cabins on this 60-foot liveaboard cater to a maximum of 10 guests. Onboard, spend your free time tanning on the unique grassy sundeck or in the air-conditioned salon. Personalized service onboard doesn’t end when you hit the water. A ratio of five divers to one dive master helps you make the most of every tank. 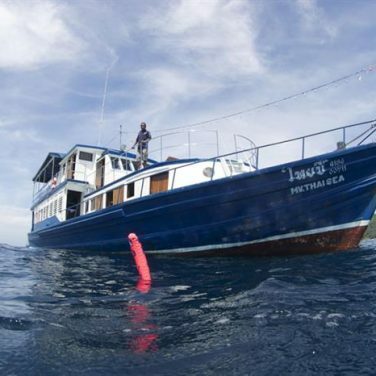 With four possible dives per day, this boat offers a lot of value for a budget trip. 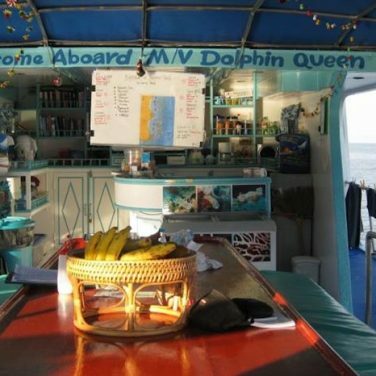 One of the area’s best budget options, the Dolphin Queen features four-day itineraries, perfect for a quick trip. 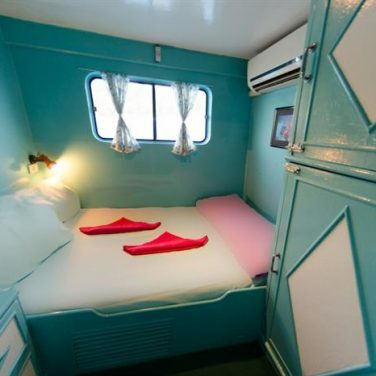 This 80-foot boat also offers dorm-style accommodations for a reduced fare, making it a favorite among backpackers. Your evenings onboard will be best spent relaxing in a hammock on the dual use open-air deck and lounge. Buffet style meals focus on Thai cuisine featuring fresh local ingredients. 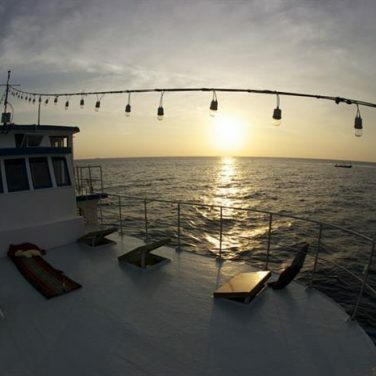 Best of all, the social atmosphere onboard is perfect for meeting new dive buddies. 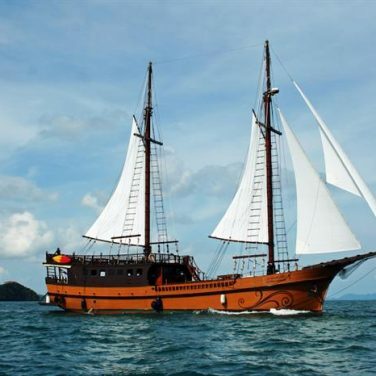 This 92-foot German run option offers real value for divers wanting to see the best of the Mergui Archipelago. The six-day itinerary stops at Black Rock, Western Rocky, Twin Island, and Shark Cave. 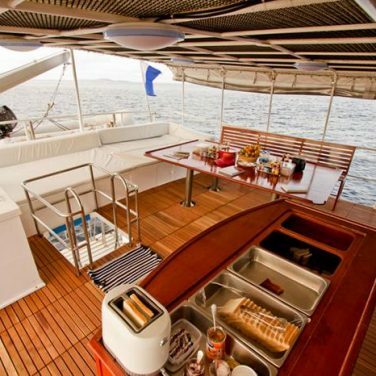 The large dive platform and shaded sundeck make this boat ideal for divers planning to hit the waves three to four times a day. 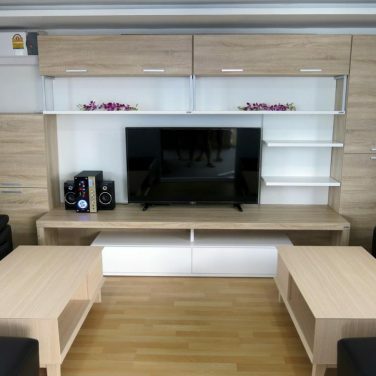 After your dives, relax in the lounge with TV, DVD, and stereo system. All 12 spacious cabins feature free Wi-Fi (in range), so you can keep up with friend and family while onboard. This boat also offers a 25 percent discount for non-divers. 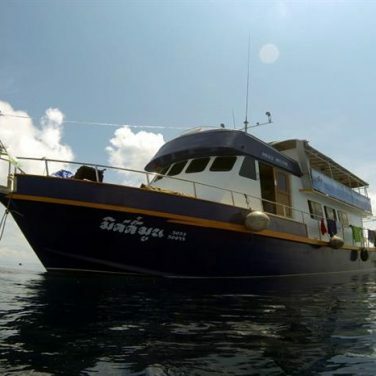 Catering to budget conscious guests ready to explore Burma, the Thai Sea Liveaboard offers an excellent value. 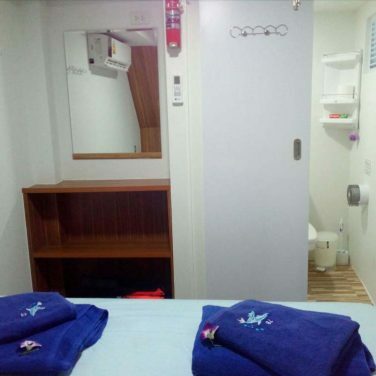 This 65-foot boat has six cabins, all with shared bathrooms. A large sundeck, traditional Thai food and entertainment room make it easy to enjoy your leisure time with other passengers. 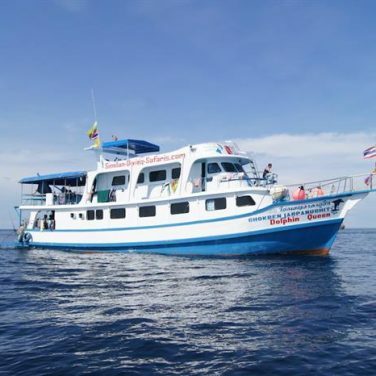 This boat’s best features are the experienced local guides, and even trips to some of this company’s secret dive sites. Small groups of four divers per guide or less ensure that you’ll see the most marine life possible. With 80 feet in length and 10 cabins, this is a busy boat. 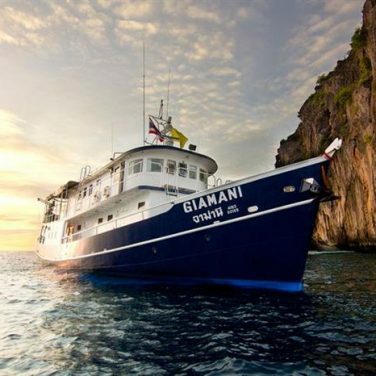 Divers flock to this top rated liveaboard thanks to Andaman Sea itineraries featuring both Thailand and Burma. 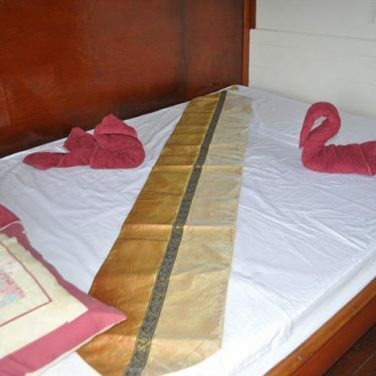 First class service and top notch diving facilities add value to this budget friendly choice. Underwater photographers and tech divers will enjoy special areas for equipment and rinsing. After an exciting day of diving, relax with a movie in the air-conditioned salon, chill out with a beer on the sun deck, or review the day’s photographs. Meals include a variety of freshly prepared Thai and International dishes. 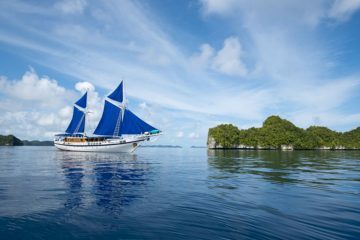 This traditional 114-foot Southeast Asian sailing yacht combines luxury and adventure for a full-service safari experience. 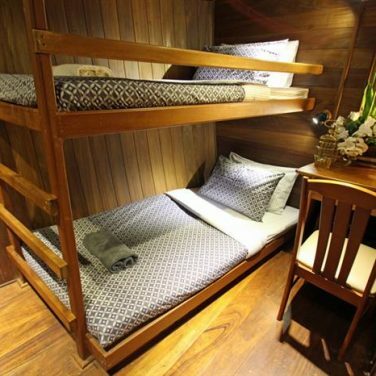 All seven cabins feature spacious, well-decorated interiors and upscale amenities. A hand carved wooden hull makes this the area’s most attractive vessel. 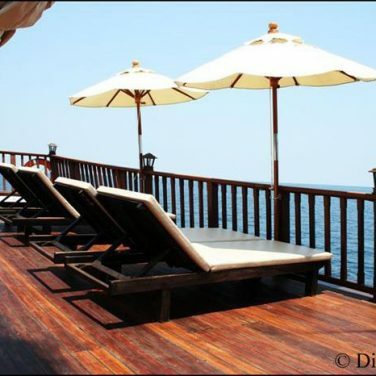 High-end perks include fine cuisine, a modern lounge, huge sun decks, and Thai massage. Adventurous guests can partake in kayaking, snorkeling, and island tours as well as diving. 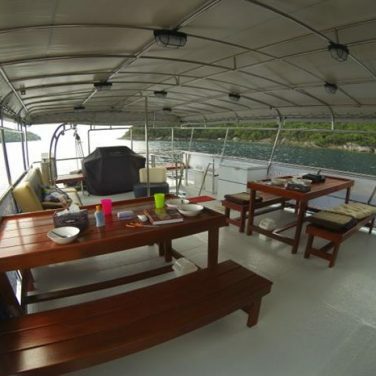 This liveaboard also offers onboard training free equipment rental. Intermediate. While the Mergui Archipelago isn’t an ideal destination for beginners, it allows plenty of options for intermediate and advanced divers. Moderate currents and open ocean conditions make this a great place to practice. And, most boats offer advanced and specialty courses onboard. 6 to 8 days. While most boats offer a 7 day “best of Mergui” itinerary, there are a few options for quick getaways and extended voyages. And, when it comes to this region, the more days at sea, the better. Remote northern and western dive sites are the most exciting and take a bit of time to reach. Calm seas, clear skies, and excellent diving conditions make the Mergui Archipelago a dream diving destination between October and May. Visibility and surface conditions are at their very best from December to April. But, your best chances for spotting manta rays and whale sharks are between February and May, when giant blooms of plankton invite them to feed. No matter what month you’re planning to visit during, you can expect hot and humid weather throughout the archipelago. Water temperatures range between 77 to 82° F (25 to 28° C), and divers should pack a full 3mm wetsuit. Visibility in this region ranges from 16 to 98 feet (5 to 30 meters) throughout the dive season. Massive plankton blooms frequently reduce water clarity, but also attract hungry pelagics like whale sharks and manta rays. The best part of liveaboard diving in the Mergui Archipelago is the adrenaline rush you get plunging into uncharted waters. These largely unexplored reefs are on the cutting edge of dive adventure, perfect for explorers who have spent a lot of time in Southeast Asia. Whale sharks and manta rays are what made diving in this region famous, but there are plenty of small animals to be found here, too. Uncrowded and unmarked dive sites keep wildlife of all sizes thriving. Each spring, large numbers of whale sharks visit the Mergui Archipelago to feast on plankton. Your best chances for diving alongside these massive filter feeders are between February and May, but the sharks inhabit these waters throughout the dive season. More remote dive sites in the less visited north and west offer the best chances for a surprise encounter with these oceanic giants. Like Mergui’s other famous residents, whale sharks, your best bet for spotting a manta ray is during the spring. Submerged plateaus, seamounts, and pinnacles invite these larger than life creatures in from open water for a visit to the cleaning stations. And, enormous plankton blooms set the stage for dramatic cyclone feeding behaviors. This region is known for unpredictable dive conditions and potentially strong currents. But, most sites offer moderate protection from the power of the open ocean. 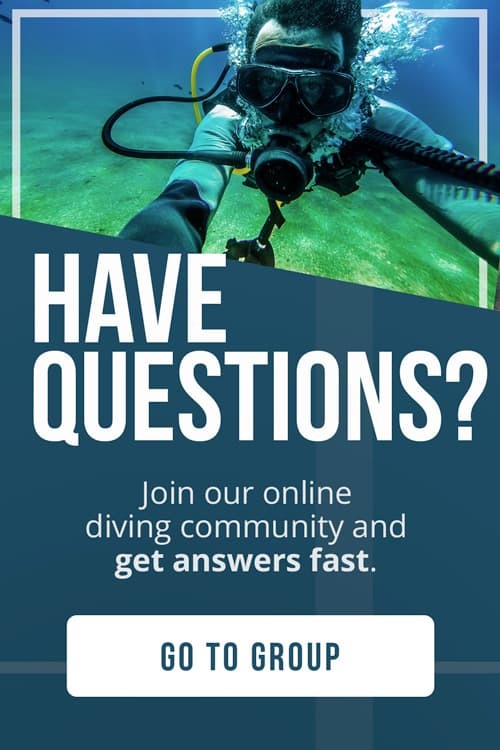 Some experience with drift diving is a prerequisite for your trip, but this is a good place to hone your skills, too. 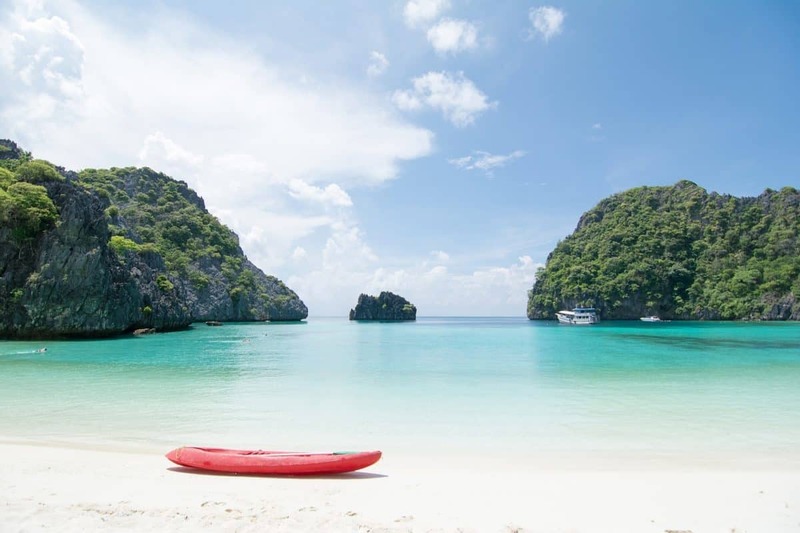 Overall, the Mergui Archipelago is an excellent choice for intermediate adventure seekers. 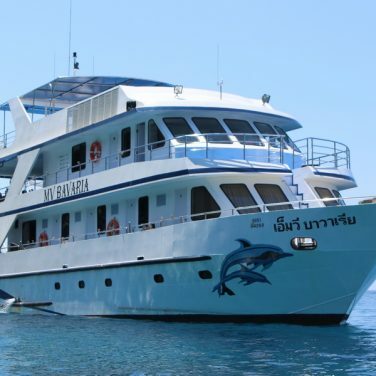 If you want to dive in the Mergui Archipelago, a liveaboard is your only option. Traditional itineraries visit all of the region’s best sites. 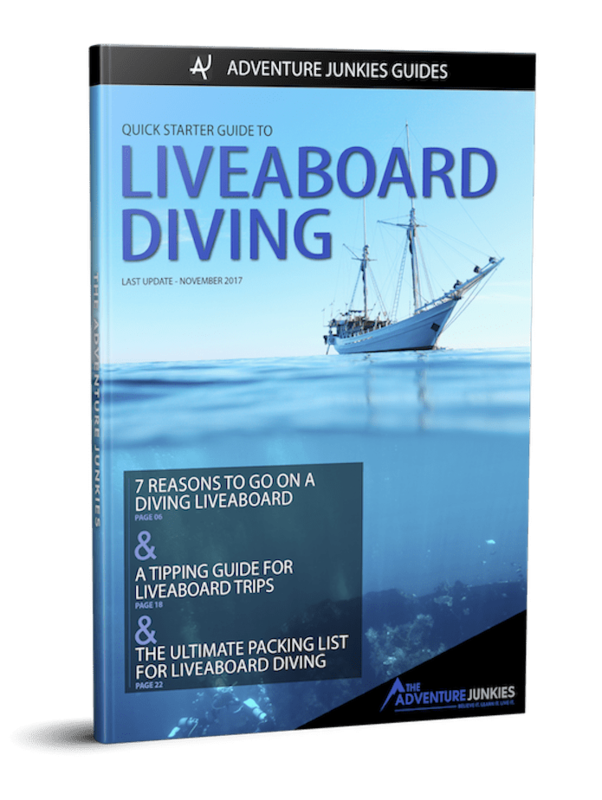 But, exactly where your trip stops will depend on how many days you are spending at sea, your budget, and the goals of other divers on board. Some of the most exciting dive sites around Mergui are found in the region’s far north around the Torres Islands. These seldom visited reefs are home to thriving hard and soft coral, and stunning wildlife. But, most boats stay closer to the central archipelago. If diving in these remote waters is a priority, an extended itinerary is your best bet. Remember that all dive site selections will be dependent on weather and ocean conditions. 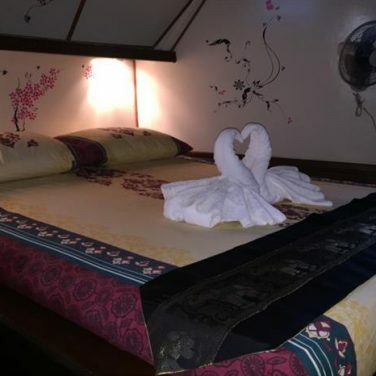 Shorter itineraries spend the majority of their time cruising in central Mergui. Conditions are calmer at these sites, thanks to protection from the open ocean. And, there is no shortage of wildlife on display. You can expect to spot sharks, rays, and plenty of macro on nearly every immersion. Though frequently visited, these sites remain uncrowded. After all, only a handful of boats visit the archipelago throughout the liveaboard season. The best-known dive sites in this region are the Burma Banks. This cluster of submerged formations is well known for chance encounters with multiple species of sharks and rays. Though overfishing has taken its toll in the area, these far removed sites retain their intrigue. A favorite destination for adventurous divers, these are Mergui’s most challenging sites, too. You can expect strong currents, open ocean conditions, and plenty of big fish. These days, fewer and fewer boats visit these far western reaches. Unpredictable conditions and a long commute deter most operators. If the banks are a significant motivation for your trip in Mergui, be sure to book an extended itinerary. And, contact your liveaboard well in advance to determine how many days you will spend there. Mergui’s least visited sites in the far north are on the cutting edge of dive adventure. Remote, isolated, and far removed from the rest of the archipelago, these waters are only visited by a handful of liveaboards each year. Massive cleaning stations attract whale sharks, schooling mantas, and passing bull and tiger sharks. Large schools of barracuda, jacks, reef sharks, and rainbow runners are among the most common sightings. Numerous seamounts and pinnacles in this region, found only with GPS coordinates, serve as secret dive sites unique to each liveaboard operator. If you’re hoping to take the plunge in uncharted waters, this area is an absolute must. The archipelago’s exposed western waters are home to an exciting variety of dive environments. Sites around South Twin Island showcase massive table corals teeming with tropical fish. Macro finds like nudibranchs, ribbon eels, and cowries are common too, making these vibrant reefs a favorite for photographers and a top pick for night dives. North Twin features similar underwater topography, but with entirely different diving conditions. 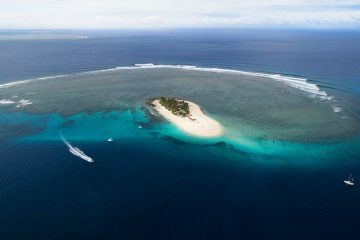 Currents are much stronger here, inviting manta rays and sharks up from the depths to feed and visit reeftop cleaning stations. Submerged pinnacles and plateaus are common around these islands. And, many can only be found using GPS coordinates. Most operators visit their own secret dive sites here, in hopes of encountering whale sharks, mantas, and even the occasional bull shark. With heart pounding sites like Black Rock, Tower Rock, and the Torres Islands on offer, it’s no surprise that this is most divers’ favorite part of the Archipelago. Underwater, you can expect massive boulder fields and plunging walls, laced with delicate hard and soft corals. This region is famous for manta ray sightings too, with nearly guaranteed encounters during spring months. Lucky divers might even spot a whale shark here, feeding on plankton in open water. The northern archipelago is well known for strong down currents and challenging conditions, but the extra effort is well worth it! Photographers should plan for hours of wide-angle action. Shark Cave is, without a doubt, the most famous dive site in the archipelago. Named for an impressive cavern frequently visited by large groups of nurse sharks, this is one of the region’s “can’t miss” experiences. Nearby reefs may appear rugged and craggy, but host an incredible variety of macro life. The rare harlequin ghost pipefish and tigertail seahorse are favorite small-scale finds. Species like leopard sharks, bamboo sharks, giant frogfish, and mantis shrimp make for fascinating photography subjects, too. The shallows in this area are top picks for dusk and night dives. Dive sites like Northern Rocky, located around MacLeod Island, feature some of the region’s finest macro. Pipefish, nudibranchs, and a multitude of pint-sized crabs and shrimp inhabit submerged boulder fields and coral gardens. Strong currents and low visibility add an element of challenge to these dives, and photographers should plan to shoot only the small stuff. Nearby, the Archipelago’s southernmost dive sites around Western Rocky, present a thrilling underwater world of pinnacles, plateaus, passages, crevices, and channels. Abundant life in all sizes is present here, but whale sharks and manta rays are the stars of the show. Most liveaboards spend at least two full days exploring this area. The most famous diving in this region, the Burma Banks are sprawling seamounts, famous for encounters with big fish. Though sharks have been hunted mercilessly worldwide, lucky divers can still swim with up to 9 species here. The banks themselves begin in very shallow water, and quickly plunge to depths well beyond the recreational diving limits. 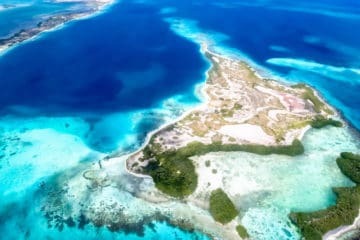 Comprised of Big, Silvertip, Rainbow, Roe, Coral, and Heckford banks, this area offers adrenaline rich drift diving with open ocean conditions. Nurse and reef sharks make appearances on nearly every dive.